The new built estate, Bloomsbury Gardens, has this week closed off, what has become over the last few years, a key safe passage cycling route of Kings Cross. The access way to the estate and for deliveries of Westminster Kingsway College, situated between Sidmouth Street and Heatcroft Street, allowed cyclists to bypass the busy Grays Inn Road on much more quiet and safe roads. This passage was part of a cycling axis connecting Doughty Street – Mecklenburgh Square – Seaford Street – Argyle Square. In fact the route was so well known and accepted, that Camden has even put up a blue sign at the exit on Sidmouth Street showing cyclists the way to Kings Cross. Is it possible that everybody knew except the developers, or was this done on purpose? Up until this week there was only a barrier that disallowed cars to enter without the barrier opening, but cyclists were able to move through unhindered, although about a good year ago the passage was slightly tightened already through fencing. Now new metal fences have been put up that close off and prevent any through access, even pedestrians can only pass through by bending underneath the barrier. 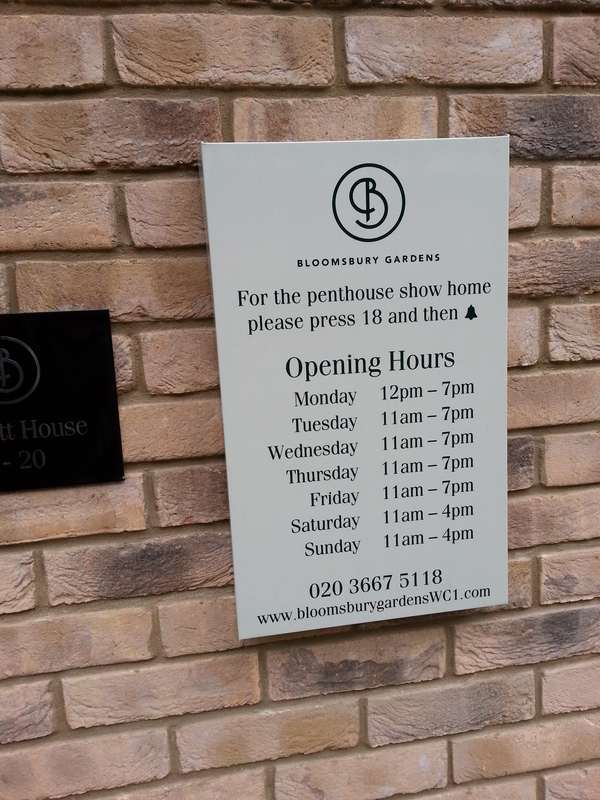 Crest Nicholson developed Bloomsbury Gardens on land that Westminster Kingsway College had sold during its own redevelopment. The planning applications concerning this land were initially opposed by locals and delayed for years as it was to become yet another private student home. In the end a private estate was agreed to, but it seems there is no intend to blend in with the local community now that the estate has been finished and the first residents have moved in. Instead it appears to become the latest example of a gated community without a clue of local conditions. Presumably they fear Kings Cross residents are undesirables and cyclists dangerous surpassers, or so one has to conclude about this strange step. But it is not to late. Hopefully Camden Council will immediately start to negotiate the reopening of this crucial route in direct talks with Westminster Kingsway and Crest Nicholson, which not only helps commuters but also children on their way to and from school and nursery on roads without much traffic and pollution. This is a part of London that actively seeks to promote cycling and reduce car traffic and we had our Kings Cross road victims too, so a closure of such an essential safe passage is simply not acceptable. This entry was posted in Community stuff, Current Affairs, Local issues, Transport and tagged Bloomsbury Gardens, bypass routes, Crest Nicholson, cycle routes, Cycling, cycling in Camden, Cycling in Kings Cross, cycling in London, developers, gated communities, Kings Cross cycling, Westminster Kingsway College. Bookmark the permalink. That’s appalling. Until recently I lived round the corner on Mecklenburgh St and I’m pretty sure there were also some markings on the bitumen (for pedestrians at least, if not also cyclists). There’s no way the developers could be unaware of its use. Do you know to whom complaints about this can be directed? I had a look at the planning approval for both the Westminster Kingsway redevelopment and the residential scheme and there is no fence at the side of the barriers restricting access to cyclists in the approved designs. Is it possible that they have just built this without planning permission. There is also nothing in the Design and Access Statement for the development. This is a really bad example of closing off cycle and pedestrian permeability. I think that this needs to be challenged. Perhaps best way would be a complaint letter to local Councillors. We have a related problem with some new developments in Islington as well. 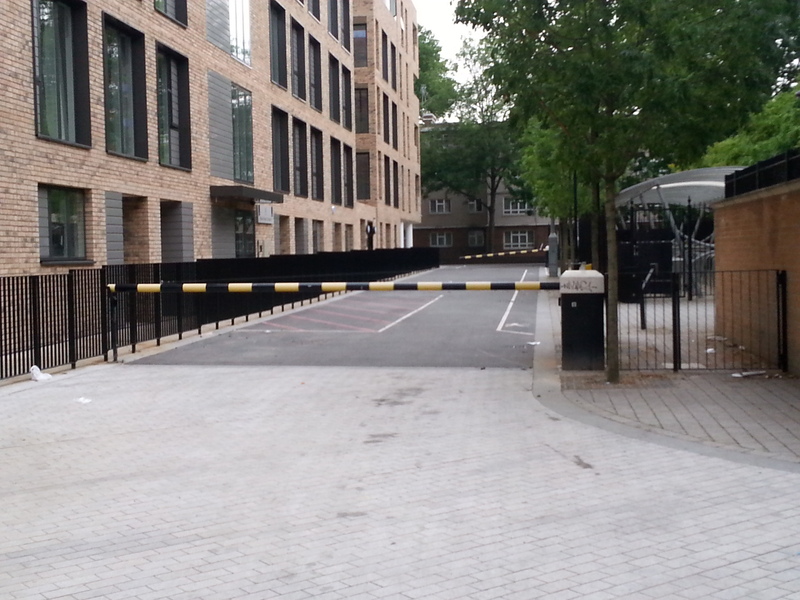 This new estate in Islington has narrow one way streets with no exemptions for cyclists http://www.icag.org.uk/2013/no-contraflow-in-new-road/ even though the borough is trying to make all roads two way to cyclists. The planners that agree to these developments seem to forget cyclists. I can not believe that they have closed this road off for cyclists. Everything in London seems to be anti cyclists. Maybe some of these council and developers should go to countries like Germany and Holland and see how well cyclists are treated there. England is a joke regarding the safety of cyclists and something needs to be done about it. Before more cyclists are killed. A portable angle grinder will open that passageway back up right quick. In fact, the barrier at the south end of the passageway is a small gate which opens “outwards”.. thus it is possible for pedestrians to get through reasonably easily, but wheelchair users, people with baby buggies and cyclists would have more difficulty, heading south. Heading north is even more tricky and I doubt that a wheelchair user would be able to manage the gate is it would be opening towards them. similar problems for buggy pushers and cyclists. the barrier is clearly designed as a disincentive to non-residents and I have written to the developers, here: bloomsburygardens@crestnicholson.com as well as to Phil Jones Camden’s Cabinet member for Regeneration, Transport & Planning.. Tobiaskx says “I had a look at the planning approval for both the Westminster Kingsway redevelopment and the residential scheme”.. Could you post the link to this application on this forum, please? I work on Gray’s Inn Road and use this route frequently to get to Kings Cross safely. I found it via a TFL cycle map so thought it was pretty official as a route. Not happy at all that this developer has cut off the only safe and pleasant way through here. Report it to Camden planning enforcement, copying in the councillors, and nag them until they do something about it. Went down to visit and realised that the gated part of the mews was at the southern end. There is something that might be interpreted as a gate in the original plans for the Mews submitted by Kingsway College in 2009. But the plans were rather unclear, the fence was not built until five years after the original application and the cycling permeability implications seem to have been completely missed by development management in Camden Council. There is nothing regarding this in their notes. It is still well worth challenging. If you look at the comments document dated 11th March 2009 the justification of the barriers is to prevent rat running. But this is not an argument which can be used to justify blocking off cycle permeability. So according to this rationale gaps should have been left at the sides of the barriers.